Some good stalking tactics will produce good carp captures! Stalking is one of the most exhilarating tactics when fishing for carp. I would love to be able to do more stalking during many of my fishing sessions. The problem with many commercial waters is that it’s difficult to stalk for carp because there's so many pegs taken up. Maybe this is the reason why many anglers don’t seem to do much stalking these days. Whatever the reason, stalking is a brilliant way to catch numerous carp, especially the bigger ones in the lake as they will often feed on loose bait in the margins. One of the positive benefits when stalking for carp is you’ll often save time by placing the hook bait into the water only when the fish are located right in front of you. This means there’s less time spent sitting behind the buzzers and waiting for long periods. Another benefit is that you’ll often know when the fish are feeding confidently because you can see them, you can also assess when it’s the best time to place the rig into the water with little disturbance. If you cannot see the fish, due to dark water or if the margins are too deep, then it can pay to bait up a few areas and visit them on a regular basis to see if you can get a take. Although, this is not as exciting, it can still produce some good results. By placing different types of particles or boilies in each spot, you can also gauge what bait they’re eating. You could use different colours and/or sizes to see what they prefer. If bright coloured boilies are left in an area, but all the other bait has been eaten, then you could conclude that the carp may spook off bright baits. 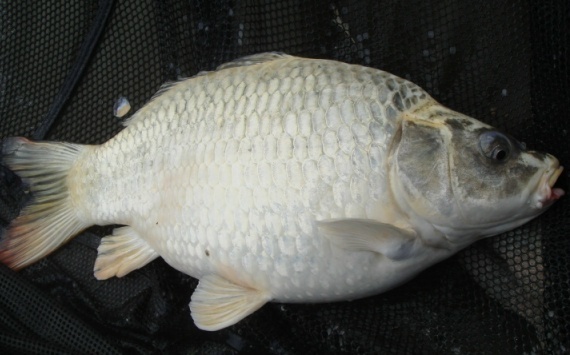 If you’re lucky enough to witness any carp feeding on your bait, you can also think about what type of fishing rig will suit the way the carp feed. This will give you an edge when fishing normal, long sessions on the same lake. So where are the best areas to stalk carp? I like to start early in the morning and quietly work my way around the lake with a bucket of various baits looking for any sight of carp in the margins, or even any signs that fish may be visiting certain margin spots. If this fails, I then look for some quiet or secure sections of the lake. Areas where I think carp will likely hang around during the day. If I’m lucky enough to see fish anywhere in the margins, I will remain low to the ground at all times and try to slowly move closer behind some bankside vegetation where I can stay hidden from sight, but somewhere I can still watch how the carp react to my bait. Once I’ve found a few places to try to stalk the carp in a new lake, I’ll throw in a few handfuls of various particles and some chopped boilies. I don’t like to throw in too much bait because the idea is to encourage fish to return, but not to stuff them so they don’t need to stay around. I want them to think that this is a new, safe feeding spot for them to frequently visit. I like to make sure I can see the bait from the bank, so it’s easier to check back later to see if the food has been eaten. I like to trickle-feed bait close to where the fish are located, however, I never throw bait on top of carp just in case it spooks them. Instead, I prefer to chuck in one or two small items about 3 feet to the side of the carp. If the fish don’t seem bothered by any minor disturbance, then I’ll gradually throw one or two particles or small, chopped boilies closer to them and watch to see if they’re interested in feeding. If any of carp decide to feed, I’ll continue to throw in more bait to tempt them to tail-end up and root around on the bottom. When carp are feeding in this way they’ll be so pre-occupied that you can easily cast in a rig into the margin without spooking them. I always try my best to reframe from casting a rig in amongst the group of fish until they are feeding confidently. It could take just one mistake for them to swim away, even if you spook just one fish, it could cause the others to either swim away or put them on high alert which will stop them feeding confidently. The best time to stalk carp is usually early morning or later in the evening as it starts to get dark. At these times the margins are generally quiet with fewer disturbances. It might be harder to stalk for carp during the day as they often move out of the margins and into the open parts of the lake, especially if the lake get busy during the day. They sometimes return to the margins towards the evening to seek out food items that may have drifted in from the wind or water currents. For fishing rigs I like to use something very simple. My thought on a rig for stalking is the more end tackle in the swim, the more chance fish can see it. My rigs for stalking carp are made up of fluorocarbon line as it is less visible. Some fluorocarbon lines are also heavy and sink well over debris with a slack line. I only use small, light leads for all my stalking for carp. Leads up to one and half ounces are usually enough to catch carp when stalking the margins. In fact, sometimes I might only use a few swan shots just to pin the line to the bottom. One tactic I have used in the past is to find a small, sunken branch or piece of debris from around the margins, then attach it to the line about 6 inches from the hook. I whip spare mono line around both the branch and main line, this is to secure the branch in place. This hides the line and end tackle even further to give carp more confidence in taking the hook bait. I always try to get away with using small, sharp hooks as these are easier to conceal on the bottom. Plus, if the fish are not moving around much, or moving with less effort, then it can be harder for the carp to set the hook when it takes the bait. It is especially important to have thin, sharp hooks when using light leads as the may not be enough weight to set the hook properly. I want the hook to penetrate the flesh deep enough to the barb so it cannot shake it out once it knows there’s something wrong. Some carp anglers use float tactics when stalking for carp, but I prefer to have all the end tackle pinned to the bottom of the lake bed and disguised well. I only like to use float tackle when surface fishing for carp, either in the margins or out in the open areas of a lake. If the water in the margins of the lake is too dark or very deep, I prefer to bait up numerous carpy looking areas and visit them on a regular basis. I will often fish for carp using free-line method so as not to cause any disturbance. This is critical because the water is too deep to see if carp are present. I may give it 15 minutes before trying another baited spot elsewhere around the margins. Before dropping a rig into a deep margin, I will always throw in a couple of food items as this helps clear the fish away slightly before introducing my baited carp fishing rig. I prefer to use bread because it’s a cheap bait, plus fish have probably encountered it many times before through people feeding the birds in ponds and lakes around the UK. So, carp will have more likely associated bread as safe to some degree. I also think the best baits are natural, live types of food, like maggots and worms, as almost any carp would take these comfortably over boilies or pellets. Learn how to Stalk for Carp as it can be an invaluable tactic to catch a bonus fish!